A 57-year-old woman presented with epigastric pain and cough for a period of 15 days, as well as a history of significant weight loss of 12 kgs in past 2 months. The patient had no significant past medical history. A chest x-ray was performed (Fig. 1), which prompted further work-up, consisting of a contrast-enhanced CT (Fig. 2) MRI (not shown), and PET-CT (Fig. 3). Frontal chest radiograph done as a part of the routine work up, revealed soft tissue opacity in the retrocardiac region, with the left heart border seen separate from the lesion. Lateral radiograph confirmed the posterior location of the mediastinal lesion. The posterior mediastinum is bounded anteriorly by the pericardium and great vessels, posteriorly by the prevertebral fascia, and laterally by the pleura.1 Its contents include the aorta, esophagus, azygous and hemiazgous vessels, neural structures, and lymph nodes. By convention, the paravertebral space is also included in the posterior mediastinum. Posterior mediastinal masses can arise from any of these structures. Morphological characteristics, enhancement patterns, and relation to surrounding organs as studied on imaging help in determining the organ of origin. Correlation with the clinical profile and histopathology are essential in arriving at the final diagnosis. These studies also play an important role in staging of the disease. Mediastinal foregut cysts result from embryologic aberrations with anomalous budding of the primitive foregut. The spectrum of anomalies includes bronchogenic cysts, esophageal duplication cysts, and neuroentric cysts. 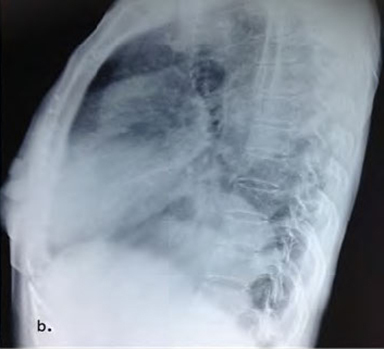 Bronchogenic cysts are most commonly located in the carinal region, while esophageal duplication cysts are most often located along the esophagus in the lower mediastinum. Neuroentric cysts communicate with the meninges and are usually associated with vertebral anomalies. Foregut cysts usually do not cause symptoms and have similar imaging features. Frontal radiographs typically reveal sharply marginated areas of increased opacity. CT reveals well-defined fluid density lesions, often with a thin enhancing wall. Occasionally, increased protein content will result in increased attenuation.1 There is no infiltration or invasion of adjacent structures and no solid tissue enhancement within the lesion. On MRI, foregut cysts appear as well-defined lesions which are hypointense on T1 and hyperintense on T2 weighted images. MR imaging is useful in determining the cystic nature of foregut lesions with an atypical appearance or increased attenuation on CT, since cysts will typically have T2 bright signal intensity, regardless of the nature of the cyst contents. Patients with descending aortic aneurysms are usually asymptomatic. 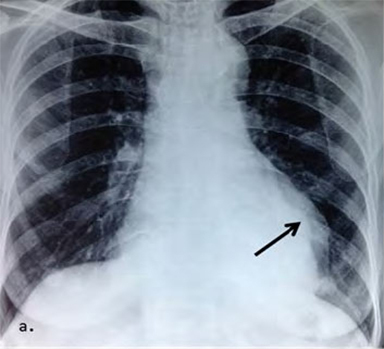 Frontal radiographs reveal a posterior mediastinal mass with the aortic shadow not seen separately from the lesion. Curvilinear calcification may be seen at the periphery of the lesion. CT and MRA will show contrast enhancement in the arterial phase. Partially thrombosed aneurysms show regions of non-enhancing clot with areas of hemorrhage. Patients with esophageal neoplasms generally present with dysphagia to solid food and weight loss. Imaging findings often lag clinical presentation; therefore, radiographs may be normal initially. When large, esophageal tumors present as a posterior mediastinal soft tissue mass. CT shows eccentric or circumferential esophageal wall thickening with dilated proximal fluid and debris-filled esophageal lumen. Exophytic components may show heterogeneous enhancement. Invasion of local structures is common due to lack of a serosa.1 MRI provides little advantage over CT.
Sarcomas are rare in the mediastinum and present as posterior mediastinal masses, which may appear ill- or well-defined on radiographs. Rib erosions may be seen. CT shows a solid mass lesion, often with infiltrative margins and heterogeneous enhancement. MRI will show heterogeneous but predominantly T1 hypointense and T2 hyperintense signal intensity with foci of hemorrhage and necrosis. Neovascularity may be present. It is uncommon for sarcomas to invade the aorta and cause aneurysm formation. No specific imaging findings are known to differentiate the various subtypes of sarcomas. Histopathology is essential for knowing the type of sarcoma. 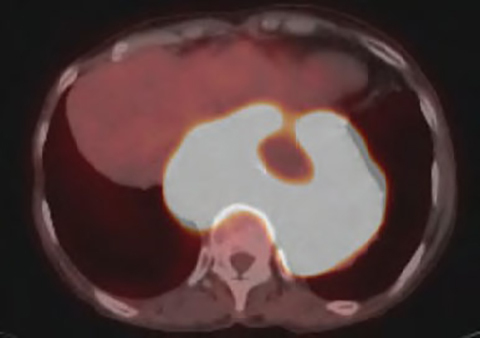 PET imaging helps in grading and staging of the tumor. Posterior mediastinal masses are usually asymptomatic and are best diagnosed by cross sectional imaging. In this case, imaging findings were of a mass lesion with heterogeneous and delayed enhancement with erosion and aneurysm formation of the descending aorta, thereby favoring a neoplastic etiology. The tumor did not involve the esophagus or vertebral bodies, and there was no intraspinal extension. Sarcoma, therefore, was the most likely diagnosis despite its rareity. A CT-guided biopsy revealed that this was a rare case of pleomorphic undifferentiated sarcoma, formerly referred to as malignant fibrous histiocytomas,4,5 with secondary involvement of the aorta. To our knowledge, only 13 cases of pleomorphic sarcoma involving the posterior mediastinum have been described in literature.6 Hence, if the imaging findings don’t fit in any of the commonly known posterior mediastinal masses, a differential of sarcoma should be kept in mind. Nakazono T, White CS, Yamasaki F, et al. MRI findings of mediastinal neurogenic tumors. Am J Roentgenol 2011;197:W643-52. Juanpere S, Cañete N, Ortuño P, et al. A diagnostic approach to the mediastinal massesA diagnostic approach to the mediastinal masses Insights Imaging 2013;4(1):29-52. Fletcher CDM, Unni KK, Mertens F, eds. World Health Organization Classification of Tumors: Pathology and Genetics of Tumours of Soft Tissue and Bone. Lyon, France, IARC Press, 2002. Fletcher CDM. Pleomorphic malignant fibrous histiocytoma: fact or fiction? A critical reappraisal based on 159 tumors diagnosed as pleomorphic sarcoma. Am J Surg Pathol 1992;16(3):213-28. Hernandez A, Gill, FI, Aventura E, et al. 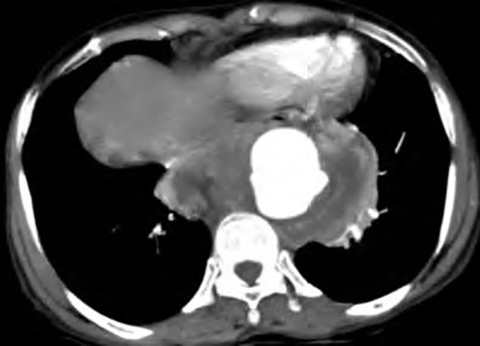 Mediastinal pleomorphic sarcoma in an immunodeficient patient: case report and review of the literature. Journal of the Louisiana State Medical Society 2012;164(1):1. Joshi A, Trivedi C, Bansal A. Posterior Mediastinal Mass. J Am Osteopath Coll Radiol. 2014;3(2):32-34. Drs. Joshi, Trivedi and Bansai all are with the Lokmanya Tilak Municipal Medical College & Lokmanya Tilak Municipal General Hospital, Sion, Mumbai, India.